An exclusive extract from 'Careful! 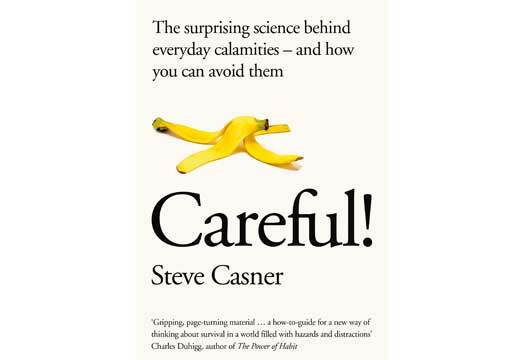 ', the new book by Steve Casner (published by Macmillan). About 2.6 million years ago, early humans used their opposable thumbs to fashion the first tools. But in a momentary lapse of carefulness, man used one of these tools to smash his opposable thumb and swearing was invented. Despite these early setbacks, tools caught on. Humans found them useful for preparing food, hunting and gathering, farming, making garments, cutting wood for fires, and improving their living quarters. Early tools were primarily made from sticks and stones, which humans quickly discovered can break your bones. Today, 2.6 million years later, about 50 percent of all unintentional injuries and deaths happen while using tools inside that house of horrors we call home. Each year, roughly one in fifteen people in the United States suffer a “medically consulted injury” while at home. Multiply those odds across a seventy-nine-year average life span and we’re no longer wondering if it’s going to happen, we’re wondering when. Things go wrong for us when we ignore two simple pieces of advice that have likely been around since that first tool was invented. To illustrate the first piece of advice, let’s drop in at a church where two guys are trying to rob the ecclesial safe. They are pounding on the end of a screwdriver with a hammer, hoping to pry open the safe door. But with one sharp blow, the screwdriver flies out and plunges handle-deep in an eye socket. If they had been using a different tool called a pry bar, they wouldn’t have had this problem. That pry bar is designed for prying. It won’t break on you, and if it slips out, you’ll still be gripping it with two hands. These church robbers made the mistake of violating rule number one of using tools. They used the wrong tool for the job. To illustrate the second piece of advice, let’s imagine we’re in the kitchen slicing a bagel. When we’re slicing a bagel, we’re not supposed to hold the bagel in our hand and saw into the bagel with a sharp knife in the direction of our palm. Why? Because while we’ll usually work that blade through the bagel and get it stopped before it reaches our palm, there are those occasions in which the blade will get hung up, suddenly break free, and then keep going. Slips like these happen all the time, but our problem here is that we’re set up to suffer the worst imaginable consequences. The mistake we make when we slice a bagel like this is to violate rule number two of using tools. We’re using the right tool for the job, but we’re using it the wrong way. Using tools in either of these two ways are examples of mistakes that set us up to be in a bad place when that other kind of error comes along, the one we call a slip. Whether we’re using the right tool in the right way or the wrong tool in the wrong way, you now know that slips are going to happen. It doesn’t matter how experienced you are at standing on swivel chairs. Sooner or later, that chair is going to suddenly twist on you. It doesn’t matter if you’ve chopped vegetables a thousand times before. As you’re mincing away on that seventeenth carrot, your mind is going to wander, or that carrot is going to be crunchier than the previous sixteen—something is eventually going to come along and foul the routine. It just happens. We’ve had 2.6 million years to think this over. So why do these injuries keep happening, like the 1,052,757 I mentioned earlier? It seems that listening to the advice and not making these two mistakes is really, really hard. What is the lure of using a screwdriver as a pry bar and sawing into a handheld bagel? Let’s find out. Right now, regardless of what time of day or night it is, there is a guy somewhere who is standing on a ladder, with a screwdriver in his mouth, using it as a third hand in order to finesse some electrical wiring into place. And despite all the advice and the fact that the screwdriver was invented more than five hundred years ago, an impressive number of people continue to show up in an emergency room pointing at a screwdriver that is lodged someplace it really shouldn’t be. When we look at a screwdriver, inappropriate uses for this tool seem to flood into our minds. It looks like it could be used to punch holes in stuff or pry things open or apart. It even looks like it could be a throwing dart. Where do these ideas come from? What goes through our minds when we see a tool and a job that needs to be done? Believe it or not, there are scientists who study this very question. In the early 1990s, Alex Kirlik, then a young professor at Georgia Tech, sat at the counter of a late-night diner in Atlanta, drinking coffee. Kirlik wasn’t trying to sober up after a long night out. He was there to work. Kirlik’s work is to watch other people work. Kirlik drinks pots of percolated coffee while watching people interact with the tools of their trade. He watches quietly for hours without saying much. Kirlik is fascinated by the way people make creative use of the tools around them. While other scientists are busy crafting laboratory experiments, Kirlik likes to hang out in places like the Majestic Diner and watch the cooks. I asked Kirlik if affordances for action could help us explain the vast number of injuries that happen every year when people use screwdrivers for something other than driving screws. He wasn’t surprised by the numbers. “With the screwdriver in hand, the whole world is a screw,” he said. “It’s so easy to imagine an infinite number of uses for it.” So maybe the key to being safer is to turn off this kind of thinking about affordances. That when we look at a screwdriver and a creative use for that tool pops into our heads, we need to drive it from our minds: to tell ourselves that tools have only one purpose and that thinking anything else is going to result in us getting hurt. When I suggested that using a dictionary for anything other than looking up words is a clear violation of the first rule of tools, he seemed unfazed. To Kirlik, noticing clever affordances for objects like screwdrivers and dictionaries is an example of creative cognition, and it might just explain the why and how of human survival and progress. I told him about the time I fell off a chair while trying to put fresh batteries in my smoke detector. After I whined my way through this story, Kirlik pointed out how coming up with makeshift things to stand on is what allowed early humans to access the high-hanging fruit. People who climbed on stuff got dessert. People who obeyed the first rule of tools didn’t. But creatively using tools is why thousands of people each year end up in the back of an ambulance. I couldn’t help thinking that there must be a middle ground here. Kirlik agreed that there is. Not every creative use of a tool is going to hurt us. I couldn’t find any dictionary-related injuries in the emergency room data. The trick is being able to tell what is likely to get us hurt and what isn’t. But here is where the deck may be stacked against us. If we look at the world in the way that Gibson suggests, creative uses for tools just leap into our minds. But imagining the ways in which an alternative use of a tool might go wrong seems to require work. It made me think of what Gabriele Oettingen said about positive thinking and what Keith Stanovich said about being cognitive misers. We quickly see the successful outcomes, but we don’t take the time to imagine the ways in which it could all go wrong. In Daniel Kahneman’s terms, affordances let us operate within System 1. We see and we do. But seeing the possible bad outcomes requires the prolonged processing of System 2, and people just don’t stop to do that very often. While the creative uses for a tool like a screwdriver are displayed in plain view, the dangers of a screwdriver are hidden like knockout drops in a drink. After a productive back-and-forth discussion, Kirlik came up with a name for the hidden dangers of tools. He called them affordances for harm. Given our creative capacity for finding uses for tools, it should come as no surprise that when we look at a screw, the thought of using a screwdriver often comes to mind. That’s right, we sometimes come up with the ingenious idea of using a tool for its intended purpose. But this doesn’t guarantee that we are going to use the tool properly. Imagine that you are trying to turn a difficult screw. It’s resisting and you’re leaning into it and pressing really hard and then . . . the screwdriver slips off and goes jabbing into whatever is beside it. What does the safety advice recommend not being there? If you answered, “My other hand,” then you are correct. According to emergency room data, 67 percent of all medically consulted screwdriver injuries happen to the hand or fingers. The trick here is to use the screwdriver the right way: to make sure that you’re using the right size screwdriver and to keep that other hand away from the work. Vises are often recommended to hold the work in place. Now when the screwdriver occasionally does slip, there is no injury. The same goes for using a kitchen knife. When chopping vegetables, we are reminded to curl the fingers on the hand that is holding the vegetable. If and when the knife slips, our fingertips are unlikely to be the landing spot for the blade. When slicing a bagel, we are told to position our flattened hand on top of the bagel, while slicing through the bagel sideways. Should the blade slip, it will not encounter the other hand. In each case, this is what is meant by the phrase using a tool properly. But when we look at the injuries that we enumerated at the beginning of the chapter, we find that we all too often stray from the script and get hurt. I remember the time I fell off a ladder. I was about six feet up doing touch-up paint on a wall and was being careful to not climb any higher than what would allow me to grab the top step of the ladder. But then I noticed a spot a few feet to the left and I reached for it, thinking nothing of it. I had no idea what was under the ladder but I quickly found out. The ladder began to tip and down I came. I landed chestfirst across the back of our couch. The force caused me to let out most of the air in my lungs, and I remember hearing or feeling something like a crack that, during a visit to the emergency room, I found out was a few ribs being broken. I couldn’t help noticing later that attached to my very own ladder in the form of a warning label is a cartoon image of a guy plummeting to the ground faster than a homesick anvil after doing the very same thing that I had just done. To my credit, I did think ahead. I went downstairs and got a ladder instead of using one of my tall kitchen chairs. But what I needed to do to avoid that injury, as Kirlik tells us, was to take a step back and look at the big picture. I might have seen that the job was going to require me to work in stages, to move the ladder each time things extended beyond my reach. And I might have also noticed the warning label. This problem has been going on for a few million years and it isn’t likely to get better anytime soon if we don’t manage to somehow overhaul the way we think when we use tools. Let’s review what we’re up against. We now know that tools can sometimes hijack our otherwise careful thinking. Tools speak to us, like little devils on our shoulder, and talk us into using them in creative ways and sometimes doing risky things. One thing that stands in the way of trying to overcome this temptation is that, as our expert just told us, in the grand scheme of human progress, finding novel uses for tools isn’t necessarily all bad. Our learned professor staunchly defends his right to use tools in ways that some might label as inappropriate. But even he concedes that we must operate within sensible limits. So how do we do better? Let’s review the advice we’ve been given. Our first challenge is to look ahead and see the bad outcomes along with the good ones whenever we pick up a tool. When the idea to use a screwdriver to pry open a metal box pops into our mind, it’s natural to visualize that lid coming open after one good push. But we also need to visualize the blade of that screwdriver snapping in two and the bottom half of the blade taking flight. When we do that and imagine all that could happen, looking for a pry bar may seem less like a hassle and more like a good idea. Our second challenge is to step back and consider the whole scene, not just the tool or implement that’s in our hand. In case you didn’t notice, we didn’t talk about the other 33 percent of those screwdriver injuries. An article I’m reading about ocular perforation injuries describes the 9 percent of screwdriver injuries that affect the eyes. After fingers, hands, and eyes, the face comes in fourth as the site of 7 percent of these injuries. You’d think that the mouth would be included in the face, but it’s not. The mouth is its own category and is the affected site of 1.5 percent of all screwdriver injuries. That still leaves another 15 percent of these injuries unaccounted for, but let’s just stop. Trust me, you don’t want to hear about some of those. Our third challenge is to work these ideas into our everyday routine so that we think this way every time we pick up something dangerous. On first glance, it looks like something I could just decide to do right here and now and be done with it. Unfortunately, it may be harder than it sounds. It’s so easy to make an exception. Just this once. Only for a second. It’ll be over before you know it. Whenever we’re in a hurry, or feeling a little lazy or even invincible, there will be our propensity for cutting corners and taking risks, waiting for us. We have another thing working against us. Not many of us know what tools are out there and how to use them properly. Some people may not know that pry bars and pinch bars even exist. For all they know, the screwdriver is their only option for prying open a church safe. How do people learn to use screwdrivers? I have bought several screwdrivers in my lifetime and not a single one of them ever came with an instruction manual. We learn about the tools we use in the kitchen and the rest of the home from one another. Our parents and other relatives and friends show us how they work when we’re young. Or we just try to figure them out on our own. Do we all learn to use the implements and tools of the home correctly? Looking at the injury statistics, it seems doubtful. Some tools and household kitchen appliances come with instructions. But many studies have demonstrated that most of us don’t use them. One of my favorite design thinkers, Jack Carroll, elaborates on what a great many perceive as our inalienable right to give anything a shot without reading the instructions first. In his book called The Nürnberg Funnel, Carroll argues that getting people to read instructions is not an easy endeavor—that we humans may not be set up to hold still and have how-to knowledge poured into the top of our heads like we were coffeemakers. As Kirlik alluded to, our survival may have required us to be a bit more maverick than that. I couldn’t help wondering what would happen if we all got formally trained. That before we were ever allowed to mince an onion, we had to complete a basic training course that taught us how to use a kitchen knife properly. The same for hand tools, ladders, washing machines, irons, and every other implement found in the home. Would those injury statistics we talked about earlier start to drop? I figured there was a way to find out. I’d ask a pro. I couldn’t help thinking that after an initial period of learned carefulness, professional chefs regress and end up being just as careless as the rest of us once they gain experience and start to feel confident and in control—a topic we’ll explore in depth in a later chapter about workplace safety. On a whim, I looked up cooking classes on the Internet to see what classes were offered in San Francisco. I quickly found a class called Knife Skills: Morning Session, in which students are advised to wear closed-toe shoes. Tuition for the three-hour class was $65 and it was sold out. So could people really complain about getting free knife-handling advice from a professional chef with such an impressive résumé? “There was resentment there,” says Benson. A week later as I was breaking the seal on the top of a new jar of peanut butter by stabbing into it with a butter knife, I realized how incredibly resistant we can be, not only when our vulnerabilities are pointed out to us but also even when we’re told exactly what to do in order to be safe. It seems that being more careful at home is not going to be an easy endeavor. And that this journey toward being more careful is going to have to originate in the private quarters of our own minds. At least now you know what you’re up against. - Careful! by Steve Casner is out now published by Macmillan, priced £18.99. Steve Casner is a research psychologist.